So this is my very first entry for Foodie Spotlight, and you are in for a treat because I decided to throw in a bit of Panda Peeks and managed to squeeze them together in one article. When I was presented with the opportunity to have lunch with Chef Bambi Sy Gobio, chef and owner of Restaurante Pia y Damaso, I did not hesitate to schedule it ASAP. Of course, I met her just very recently for foodpanda’s Good Food Tour, but I just couldn’t wait to hear more about her stories. I immediately packed up my camera, my computer and I rushed to meet with her in her restaurant in Greenbelt-5. Friday afternoon, I arrived in Greenbelt and met Bambi in her newly renovated restaurant. 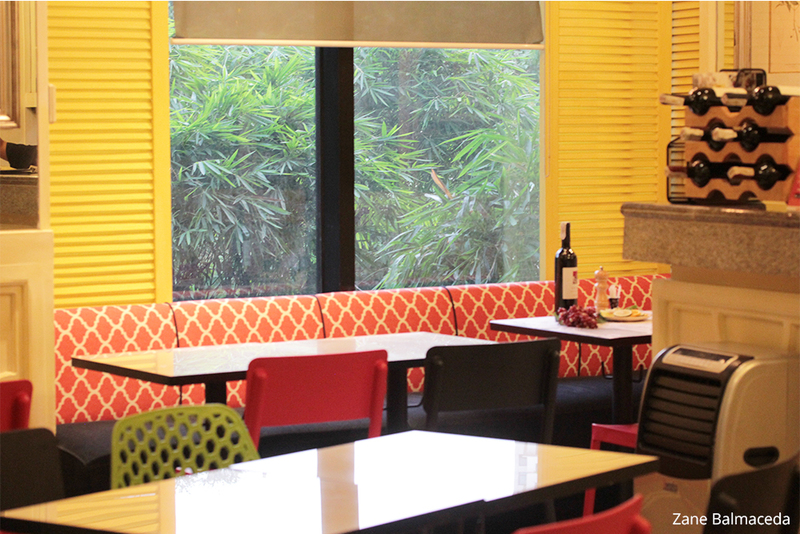 The bar area has been moved to give more space to the dining area and the space is now filled with playful colours. The old black and white theme has now been replaced with light shades of yellow, deep blue and bright red. Upon re-opening on 01 August, Bambi made sure that her menu is complete with all the new dishes she featured on our Good Food Tour. Just wait to the food part of this article and I’ll tell you more about it. In a way, this Spotlight interview has bits and pieces of Panda Peeks in it because I just couldn’t resist Bambi’s food. My three most favourite “F” words were right in front of me – free, food and Friday. And who knows, maybe I could add the word “friend” after this interview. 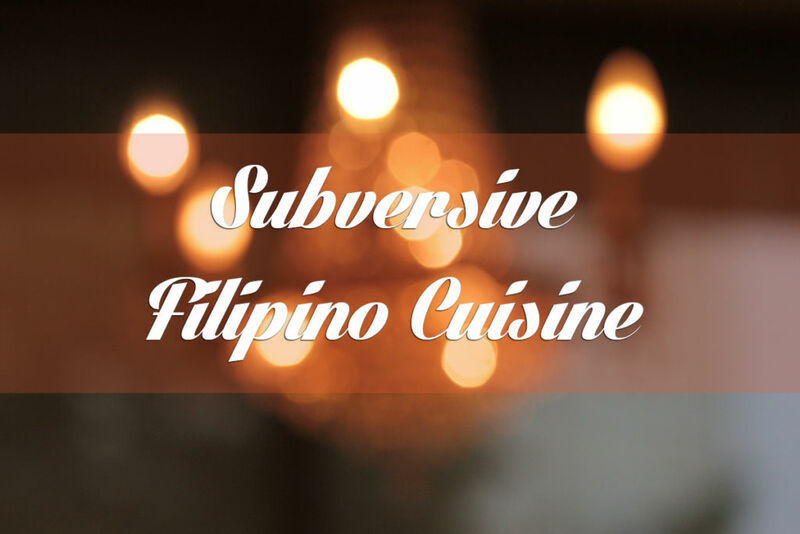 Restaurante Pia y Damaso has been around since 2007 with the very original concept of subversive Filipino cuisine. Bambi’s unique and creative take on the classic Pinoy dishes gives that distinct subversive spin – fresh and clean flavours, comfortingly familiar yet refreshingly different. What inspired your career choice? 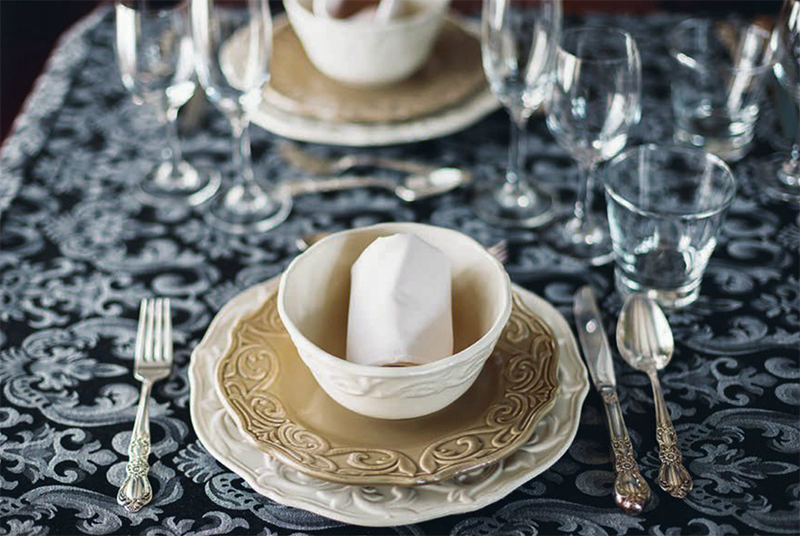 Bambi: I’ve always been fascinated with food since I was only eight years old. My mom let me cook and practice on any food I wanted to experiment with. Sometimes, she would clip a recipe from a magazine or a newspaper, hand it over to me, and say, “Here, make this. Make sure it’s nice”. Whenever someone in the family would celebrate birthdays and even on Christmas, my mom would let me bake. It was like the kitchen was my very own personal playground and since then, I knew, this was the career path I was headed to. So after I graduated from UP Diliman, I studied again in the Culinary Institute of Amercia in New York and then I moved to Toronto where I got my internship in Four Seasons Hotel Toronto. My first job was at Bouley in New York. What made you decide to move back to the Philippines? Bambi: I never thought that eventually, I would be moving back home. I guess it’s just as simple as saying home is where the heart is. Cos you know, New York and Toronto are both very fast-paced cities and if you live there, you really have to do everything on your own. Besides, it just really feels good to be back. I can still pursue my passion and now I own three restaurants. My first restaurant is also in Makati, it’s called Kooky and Luscious, along Ayala Avenue. 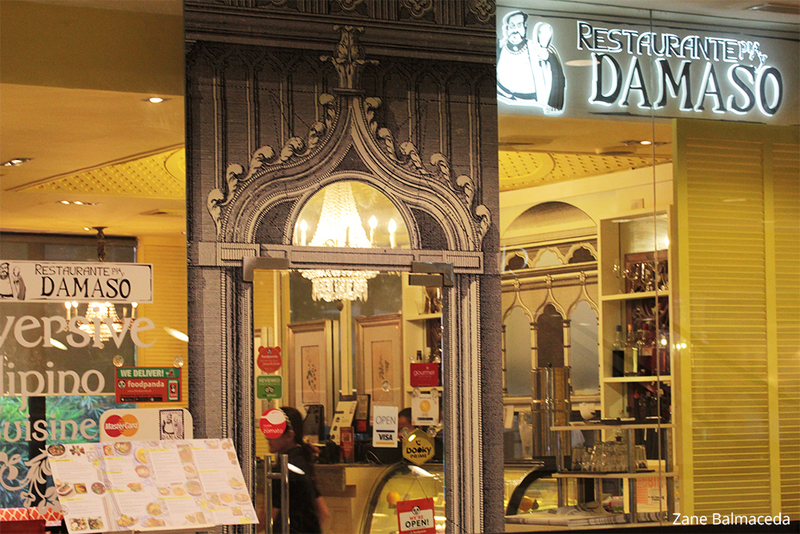 Then later on, an offer from Ayala Malls management came and the idea was to put up a Filipino restaurant, and that’s when Restaurante Pia y Damaso started. An extension of Restaurante Pia y Damaso, which I call Residencia is located in Green Hills. 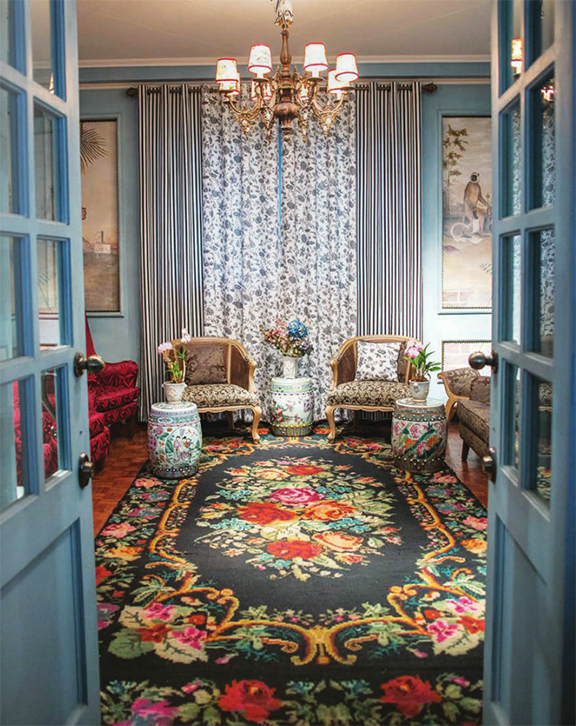 It’s mainly a space for gatherings like weddings, anniversaries and other intimate occasions. My work is a challenge to be creative and innovative here in the Philippines. How did the “subversive theme” come about? 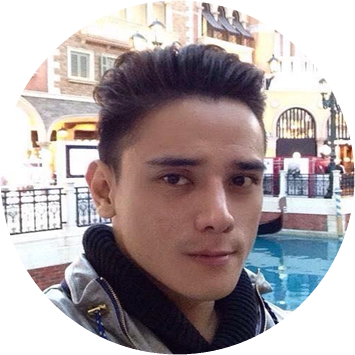 Bambi: This space in Greenbelt was offered to me to put up a Filipino concept restaurant. First, it was my brother’s idea to name it Damaso and our creative juices started flowing in. I went back to the old El Filibusterismo and Noli Me Tangere days and I thought, I needed a good catch phrase. In the books, the characters of Ibarra and the students were branded as “subversive” because they wanted the Filipinos to learn the Spanish language in order for them to be equal with the Spanish people. Hence, I was trying to convey through my food, that our culinary bounty is as good as those from other countries if we just put a little thought in creativity. History plays an intrinsic role in the cuisines that a nation eats – how do you think this has affected Filipino food in general? Bambi: Our very own unique and bold flavours are highly influenced by the Spanish culture and that will never change. This is just one of the reasons why the food we serve are themed after the books of Jose Rizal, written during the time when the Philippines was ruled by the Spanish people. In general, I just can’t imagine what kind of food we would have today if not for that bit of history. Today, I think the Filipino food is still in the process of evolution and I am excited to share more positive and creative ideas we have that can also, possibly, make history as we speak. What is the one thing that sets Filipino food scene apart from many other places you’ve travelled to? Bambi: I had lived in the US and Canada and I’ve also travelled to a lot of other wonderful places in Europe and Asia and I can honestly say that our food is one of the most diverse and innovative kind that can still be authentic at the same time. We adapt easily to new things and our creativity makes it easy to mix the old and the new and come up with something that is extraordinary. Among all the dishes you created, which one is the most memorable to you? 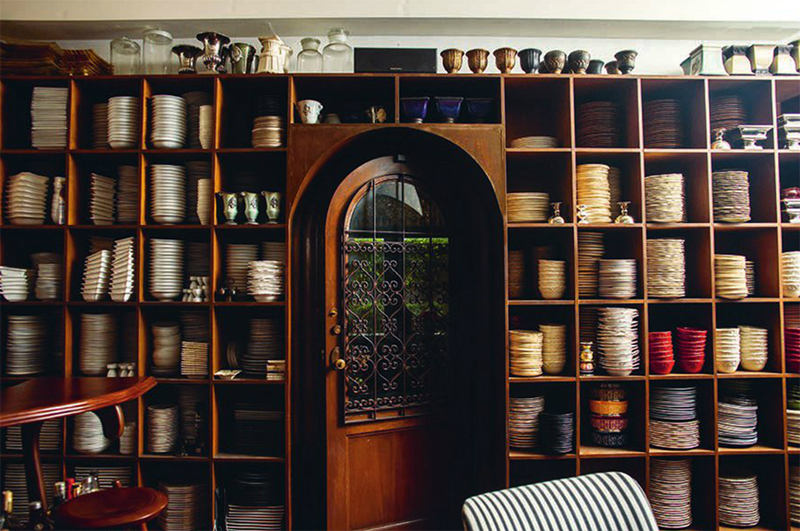 Bambi: Every dish I create has its own story and memories. But if I have to pick one, that would have to be my Sisa’s Dementia cake. Initially, I called it Dementia and it was just so perfect to name it after Sisa (another character from the books of Rizal). During my internship in Toronto, my mentor had finally agreed to let me experiment on my own. Today, this cake is already about twenty-five years old and it never gets old. 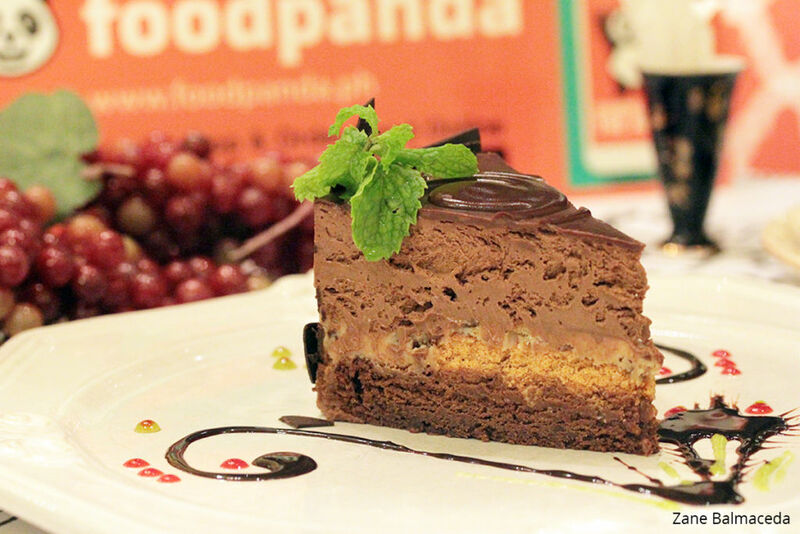 It’s available here in Restaurante Pia y Damaso and in Kooky and Luscious. Right after the interview, Bambi ordered food that we could share. 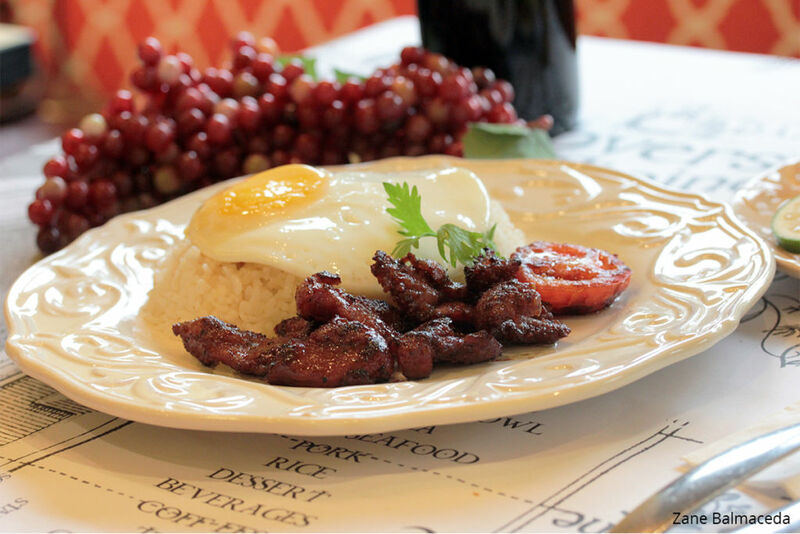 First to land on our table were the Filipino classics typically served at breakfast in many Pinoy household – Beef Tapa with Fried Rice and Eggs and Tocino with Fried Rice and Eggs. You may order the eggs according to your liking, and on that day, we decided to enjoy it scrambled and sunny side-up. I do not usually enjoy scrambled eggs cooked with tomato and onions, but this one is a game changer for me. I absolutely loved the tender pieces of beef. Juicy and not too salty. The garlic rice added that extra aroma to the pairing of the egg and the beef. I’d say, if you are looking for a place where you can enjoy a relaxing, laid back weekend brunch, this one has to be the first in your list. A good Tocino for me must have a good balance of sweetness and saltiness. Fortunately for me, Bambi’s version has that perfect balance. It tasted as good as it looked. The sunny-side up was served with a runny yolk. Simple yet classy. As Chef Anthony Bourdain once said, “Good food is very often, even most often, simple food”. This one is definitely a must-try. 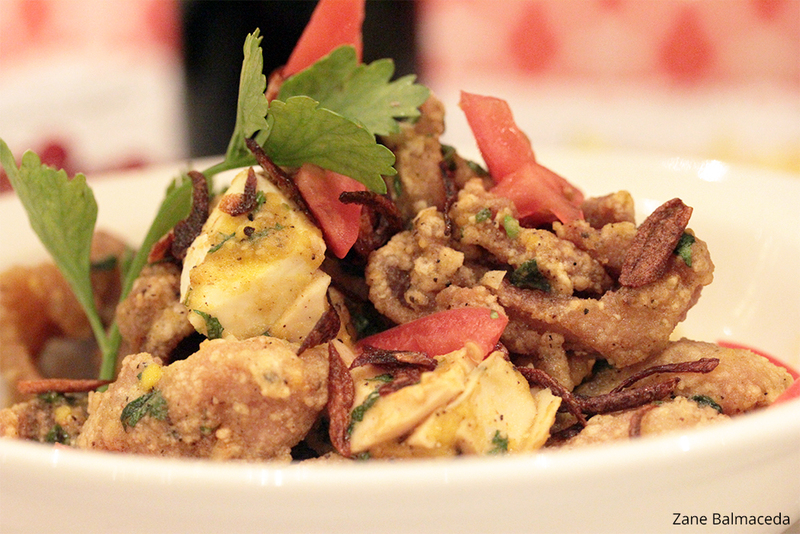 Next, Don Tiburcio’s Octopus was served to us. It was served with garlic, chili, smoked paprika and olive oil. I could taste the mild spices which blended well with the oil, the aroma of the garlic and of course the distinct flavour of the octopus. It was the first time I’ve ever tasted octopus, and it was good! I am absolutely coming back for more of this! The next one would have to be my favourite (apart from the desserts, of course). 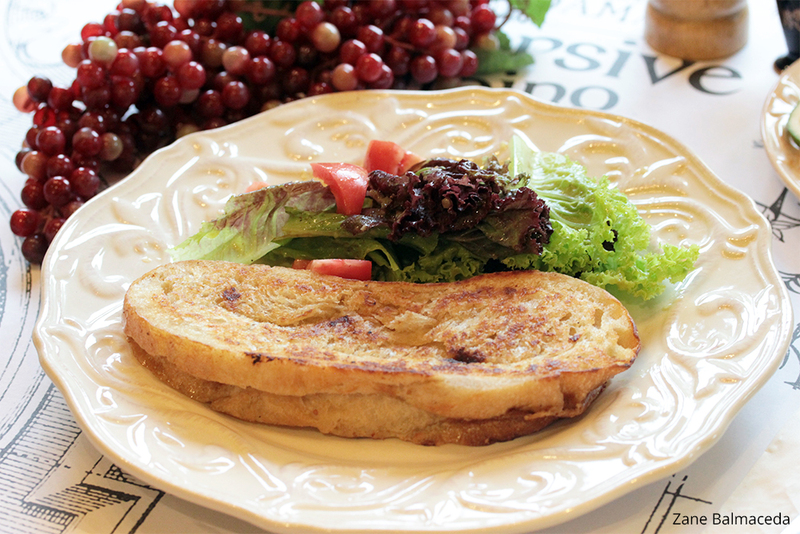 Meet Pilosopong Tacio’s Cheese Pimiento Croque. Bambi makes her own bread, pimiento and everything else from scratch. It didn’t look appealing to me at first and the fact that I rarely eat sandwiches made me hesitate. But as soon as she started slicing it in to half, the rich aroma of her homemade cheese pimiento made with their own secret spices was just so inviting. From there I knew, I really had to get my hands on this, and I am glad I did. Needless to say, all of Pilosopong Tacio is now resting in my tummy. If you love Eggs Benedict, I am absolutely sure you’re gonna love this next one. 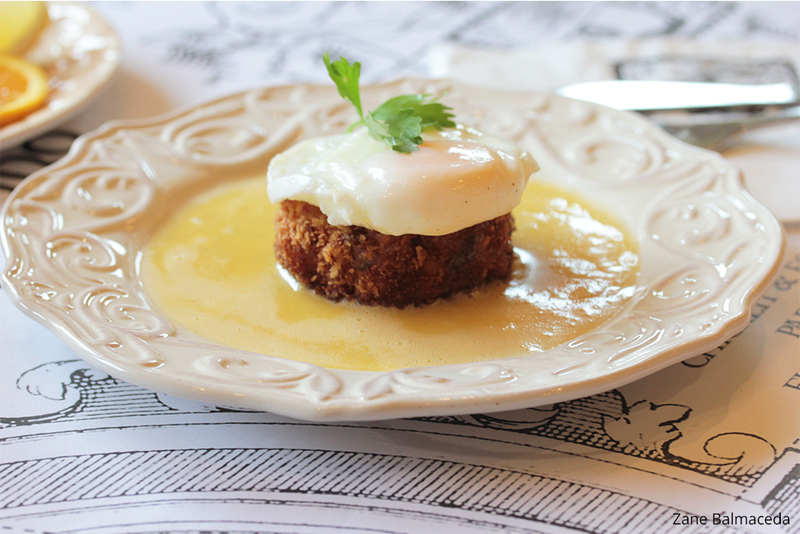 Introducing Potato Cake Eggs Benedict with Calamansi Hollandaise. Who would have thought that a crispy, fried potato cake could give an interesting spin to the usual Eggs Ben? To give an even more local twist, Bambi used calamansi in her hollandaise instead of the usual vinegar or lemon juice. If this doesn’t make you crave, I don’t know what will. I’ve always been a fan of Tokwa’t Baboy. I like it mildly spicy and with crispy fried tofu. Enter – Tokwa’t Baboy ni Dona Consolacion. 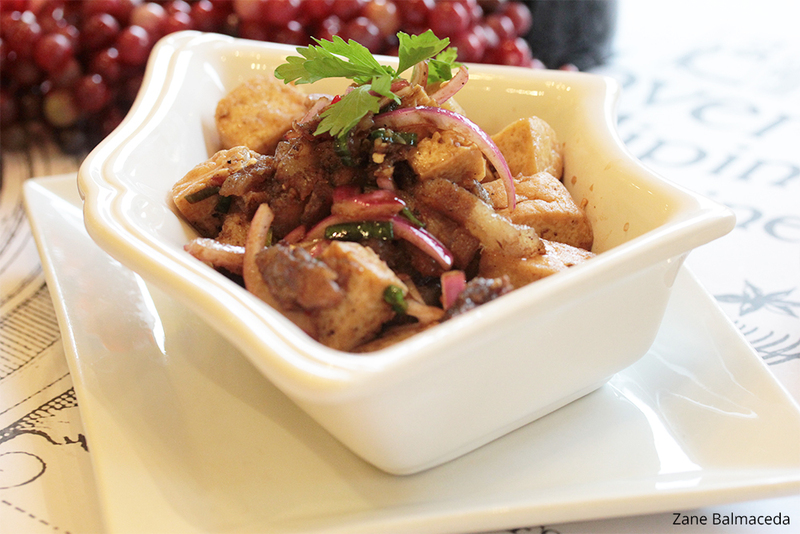 It has the same goodness of the traditional version, served with fried bean curd, pig’s ears, red onion, garlic, chili, soy and vinegar dressing. It instantly took me back to my younger days when my mum and my grandma would cook this dish for me whenever I wanted it. A good example of a simple dish that satisfies the native tongue. Water Buffalo Calderetta ni Tandang Selo would be a first for me. I have never tried eating Water Buffalo or what’s locally known as calabaw. The restaurant offers two variations of this popular local stew: They serve Water Buffalo and the other one is Lamb Calderetta. 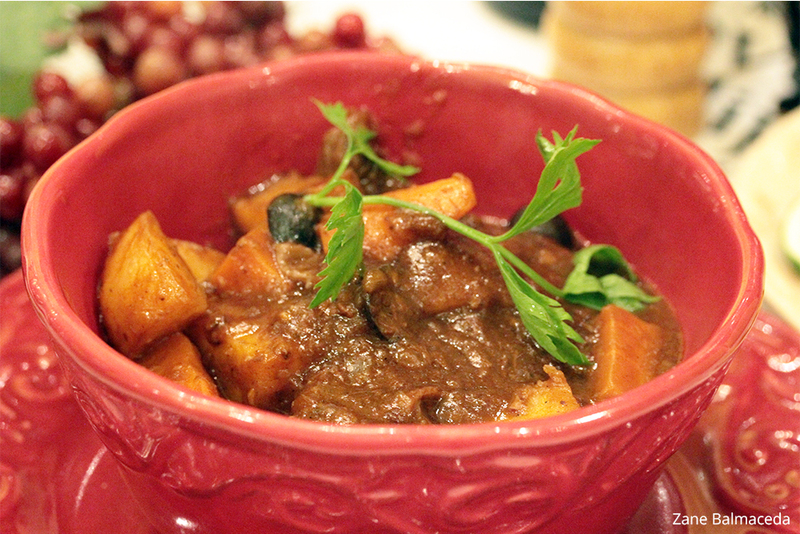 It tastes just as good as the traditional Beef Calderetta, only that the calabaw meat has almost zero fat. The Lamb Calderetta on the other hand is the fatty one. The meat was tender and tasty and the sauce was nice and thick. 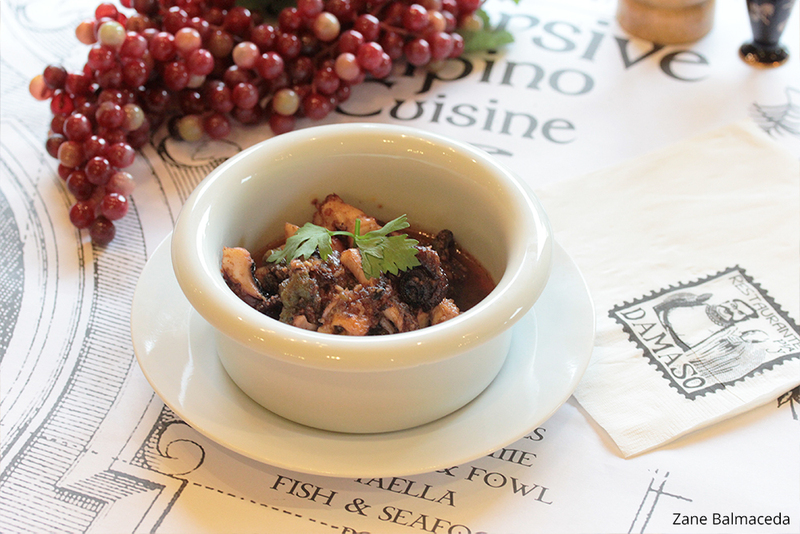 This native stew was served with tomato, rum, peppers, olives and potato. If you are the adventurous kind, you will surely love this. The next dish was another one of my most favourite part of my visit – Fried Chicken with Salted Egg. 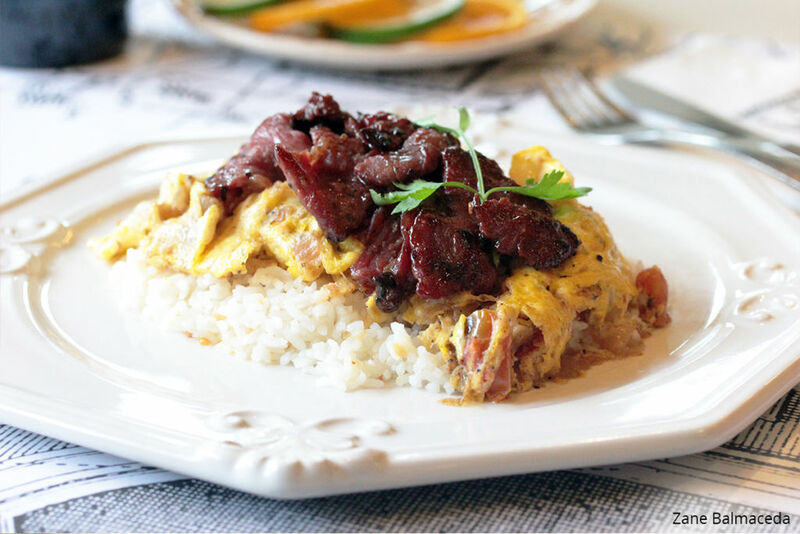 Another simple Filipino dish turned into a stylish gourmet treat. The perfectly-fried, crispy chicken meat and skin went well with the bold flavours of the salted egg. The complex flavours and textures mixed very nicely which bursted into a rich and satisfying experience. Sinful, but good! I was just so happy that Bambi managed to pack more of this for me to take home. Now, there is still a lot of dishes in my list. But I will have to feature the next ones on the actual Panda Peeks feature on Restaurante Pia y Damaso which I will publish next week. Watch out for Pan Seared Pork Belly with Pineapple Cilantro Catsup, Crispy Prawn Gambas Makaraig, Monggo Puree with Tinapa and Chicharon, Bangus Belly Sinigang in Guava, Arroz Kubanang Kalabaw ni Kabesang Tales, Chorizo Pandesal, Longganiza Pandesal, Sotanghon Palabok and a long list of desserts! That’s a promise! You wouldn’t wanna miss that bit, would you? Born and raised in a multi-cultural environment and a firm believer that the best way to learn is to travel the world. He enjoys hiking and outdoor bootcamp. Daddy to a yorkie. His passion for arts, writing, food and business administration lead him to be foodpanda’s Senior Marketing Manager in Hong Kong and in the Philippines. Follow him on IG @madeinzane.